1. 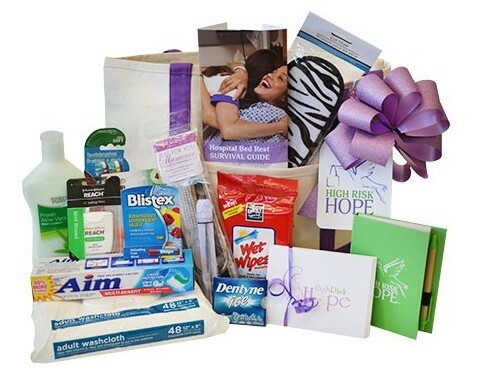 HRH mini Bed Rest Basket ($35 – $60) – This smaller version of HRH’s Bed Rest Basket contains top ranked patient items (HRH Bed Rest Survival Guide, adult washcloths, antibacterial wipes, dental floss, ear plugs, eye mask, gum, journal, lip balm, lotion, pedicure set, thank you notes, toothpaste, toothbrush). You may also select any of the other products in the HRH Store to include in your gift, including acrylic cup, HRH calendar, HRH ornament, fleece blanket, etc. 2. Dry Shampoo ($10 – $30) – How does your hair look when you don’t wash it every day? Think about how it may look if you go without a shower for a week. 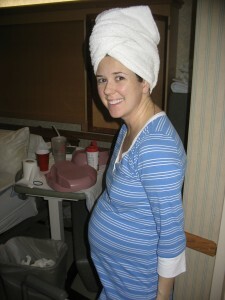 Shower privileges vary by patient but all moms are encouraged to minimize their time out of bed, including showers. Dry shampoo is a great gift to help your hair be presentable in between shower days. There are many options available, I suggest buying the largest quantity of an organic brand your budget allows. 3. Scrapbook kit ($20 -$40) – This gift can be big or small and you can really make it your own. Michaels craft store is another place that is practically giving things away during the holidays so you can put together a beautiful scrapbook kit for under $50. This will be a gift that will eat up time for your friend in the hospital and she will cherish for years as she looks back on her time in the hospital. 4. Entertainment box ($30 – $50) – Putting together a box of books, magazines and DVDs will provide hours of entertainment. DVDs are always on super sale during the holidays and you can stretch your dollar here big time. For example, on Black Friday I saw the entire first season of Downtown Abby on sale for $10 at Target. You can’t beat that price! 5. Nightgowns ($15 – $30 each) – Hospital gowns get old on day one and new nightgowns will be a crowd pleaser, trust me! When you are shopping for a nightgown, you will want to buy one made of a soft jersey fabric that is V-neck (think breast feeding later on) and long sleeve (shaving is a luxury). You don’t have to buy maternity if you find the right nightgown, just go a size up from her regular size. As much as you want the tags to be on, wash them before you give them to her so they are ready to wear. 6. Holiday décor ($25 – $50) – This gift is fun and will provide encouragement for your friend the entire holiday season. You do not have to go fancy and expensive here. If you go to the Dollar Tree (one of my favorites) you can decorate the entire room for any holiday for $25. 7. Restaurant gift card – Hospital meals are not good and you can’t cook at home when you are bedridden. A gift card to a restaurant that delivers is a great gift. There are plenty to choose from, one of my favorites is Doormet in Tampa because their menu goes way beyond pizza! 8. Potted plants ($10 – $20) – Fresh flowers are beautiful but make sure to give potted plants rather than floral arrangements. While floral arrangements are thoughtful gifts, they usually die way before your friend is getting out of that bed, and that is mentally devastating. SAMs club usually has beautiful orchids for less than $20, which can last for months. 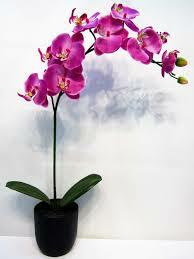 If your friend has a green thumb, she may even be able to keep the orchid at home to bloom for years to come. 9. Slippers ($10 – $20) – Slippers are a must in the hospital for trips to the bathroom. No matter how many times hospital floors are cleaned, no one wants to walk barefoot on a cold hospital floor. 10. Your time (priceless) –Make a quick mental list of everything you need to do to get ready for the holidays (decorations, holiday photos, holiday cards, buy gifts, hide gifts, wrap gifts, clean house, grocery shopping, etc.). Now imagine trying to do one of those things from a hospital bed. The best gift you can give a mom on bed rest may be the time and effort it takes to do a few items on her holiday to-do list. Taking on decorating someone else’s Christmas tree is a big task, so why not get a group of your friends together and make a night of it? You could even Skype in your friend so she can be a part of the fun. For any of these gifts, remember presentation is key and it’s the thought that counts. Take the time to wrap it beautifully with a great bow and present it in person with a smile. There is only one gift your friend really wants this year and your thoughtful gift will play an indirect role in ensuring she receives it, a healthy baby.